Here at Woman’s Own we’re always on the look out for a show-stopping but speedy dessert. 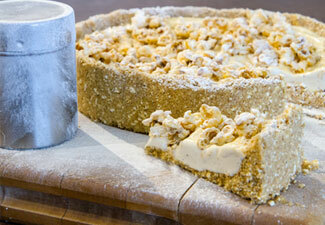 Delicious and ready in just 35 minutes, we think that Green & Blacks ice cream popcorn pie fits the bill perfectly. 1. Blitz the digestives with 75g of the popcorn in a blender until you have fine crumbs. Add the salt and melted butter and mix well. 2. Tip the mixture into a 20-23cm loose bottomed tart tin. Using your fingers spread the mixture out and up the sides of the tin evenly. Set in the fridge for at least half an hour until firm. 3. Soften the ice cream a little (under no circumstances allow it to melt completely) and smooth into the case. Scatter with popcorn and return to the freezer to firm up for half an hour. 4. To serve, remove the tin from the freezer and leave it at room temperature for a few minutes before removing the tart from the tin (do this by placing a jar underneath the tin and gently work the sides down).